Style: Name Necklace/Love Necklace Pendant Size: 3-4.5CM（1.2INCH-1.8INCH） Hook: Double Hooks Chain type: Cable Chain Material: 925 Silver Style: Name Necklace/Love Necklace Pendant Size: 3-4.5CM（1.2INCH-1.8INCH） Hook: Double Hooks Chain type: Cable Chain Material: 925 Silver Personalized Necklaces Nameplate Carrie in Gold With unique Vivace BT Font, this personalised name pendant for Women in Sterling Silver is one of our smallest letter necklaces yet! This carrie style name necklace comes with a unique font that can be customized with the name or word of your choice. 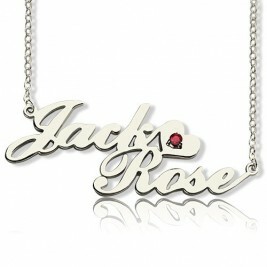 This letter necklace is made from 925 Sterling Silver and hangs on a Silver Box Chain. 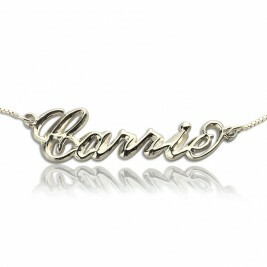 The beautiful Carrie necklace goes well with any outfit and it can be completely customized with your name or any other word. 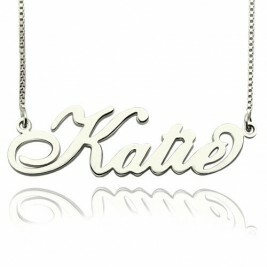 Integrating the name style in your day to day style allow it to have a similar sentimental value as that of the original Carrie necklace. 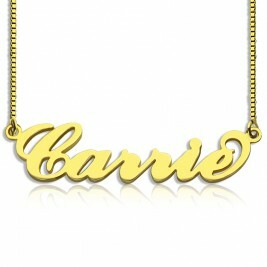 It is also a great gifting option for your loved ones and giving them a carrie style personalised with their name would definitely enhance your bond with them. 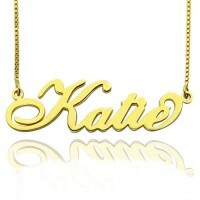 The elegant Carrie necklace is suited to all personalities. You can make it your won by adding other jewellery like gemstones or using other material. 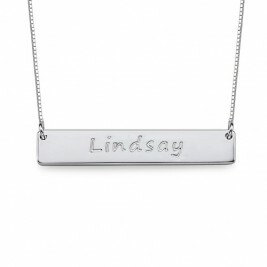 The necklace becomes a part of personality when you add your own customization to it like Carrie necklace with double thickness or Carrie necklaces with your own birthstone embellished in it. It is also a great option for you and your group of friends to buy some Carrie necklaces together to strengthen the amazing bond that you guys share with this special necklace that symbolizes the power and strength of friendship. 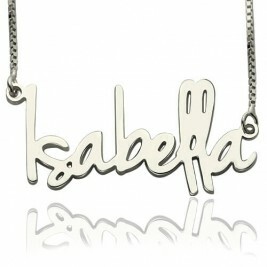 Necklaces made of silver look classy and pretty and are suitable for wearing everyday. Due to the softness and malleability of pure silver, it is combined with other metals to make a stronger silver alloy called sterling silver. It is not advisable to use that silver for making your Carrie necklace that is alloyed with Nickel as a lot of people are allergic to it. Instead, look for silver that is alloyed with either zinc or copper, which are not allergenic. Carrie necklaces that are made with gold look classy as well as flattering and emit a beautiful and warm radiance. Being resistant to tarnish as well as rust, unlike silver, a gold Carrie necklace can be worn at all times without any fear of discoloration or scratching. Pure gold is 24 karat pure, and cannot be used because of its strong malleability and is therefore combined with other metals to create gold of 18 karat and 14 carat, with purity of 75% and 60% respectively. 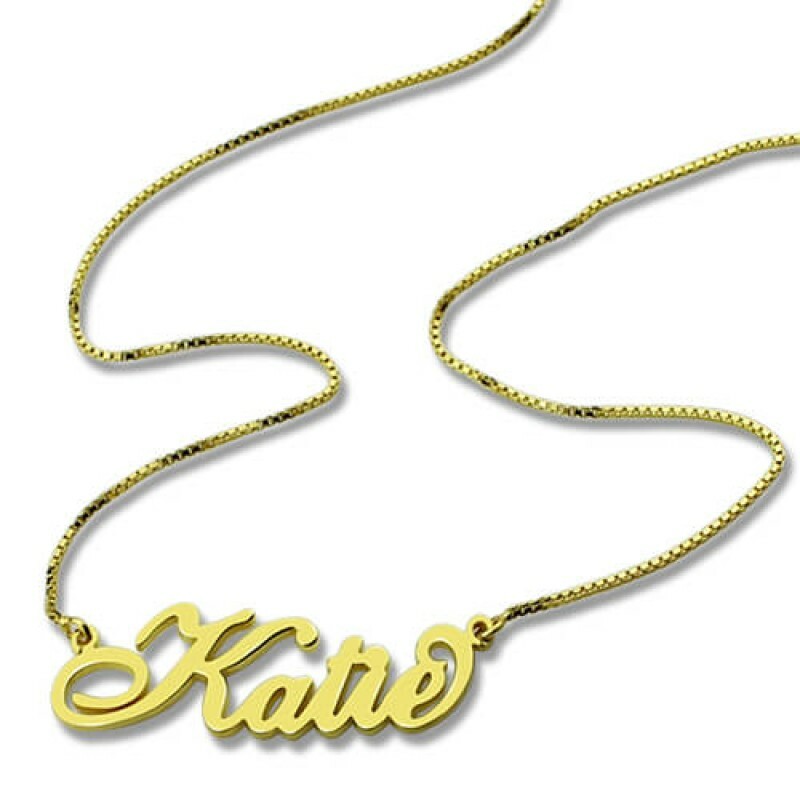 The most popular choice is yellow gold while white gold possesses a sheen similar to silver and rose gold can provide a classic look to your Carrie necklace but still look modern and relevant. 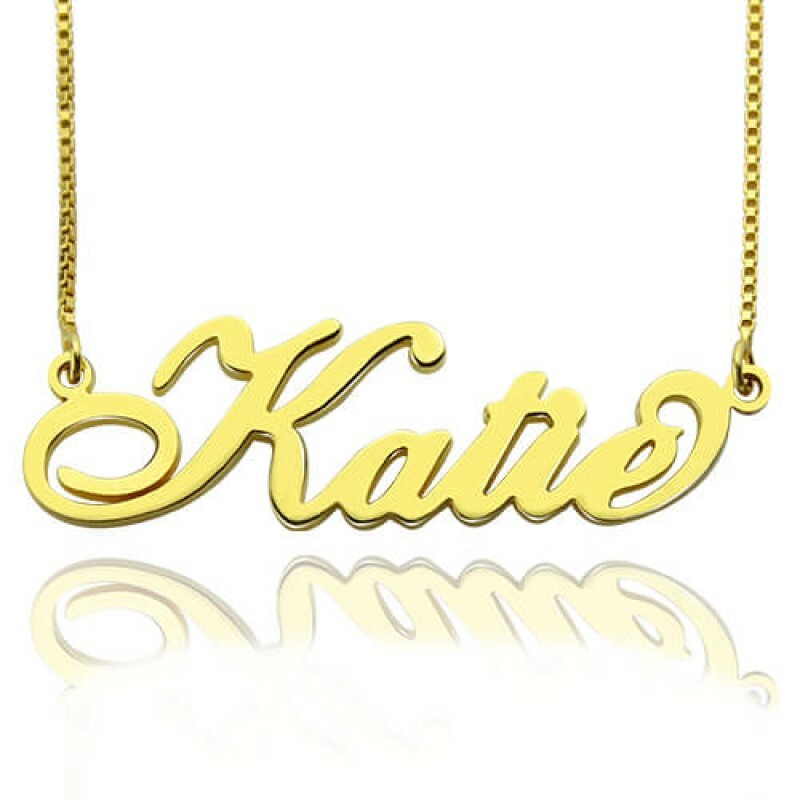 When customizing your Carrie necklace, it is important to be informed about necklace length as it determines the overall position and appearance of the Carrie necklace on your chest. 16 inches: The necklaces of this length are categorized as chokers and sit just above the collarbone and accentuate the neckline of the person wearing it. 18 inches: This length allows the necklace to just hang slightly over the collarbones and is the most popular necklace length among women. Also known as Princess length. 24 inches: Necklaces with this length of chain are known as Opera length necklaces and look best worn over dresses or blouse and this is a dramatic length and way too large for your Carrie necklace. The monogram or the initial necklace has a timeless appeal to it and goes with any sort of outfit, irrespective of the way you dress. 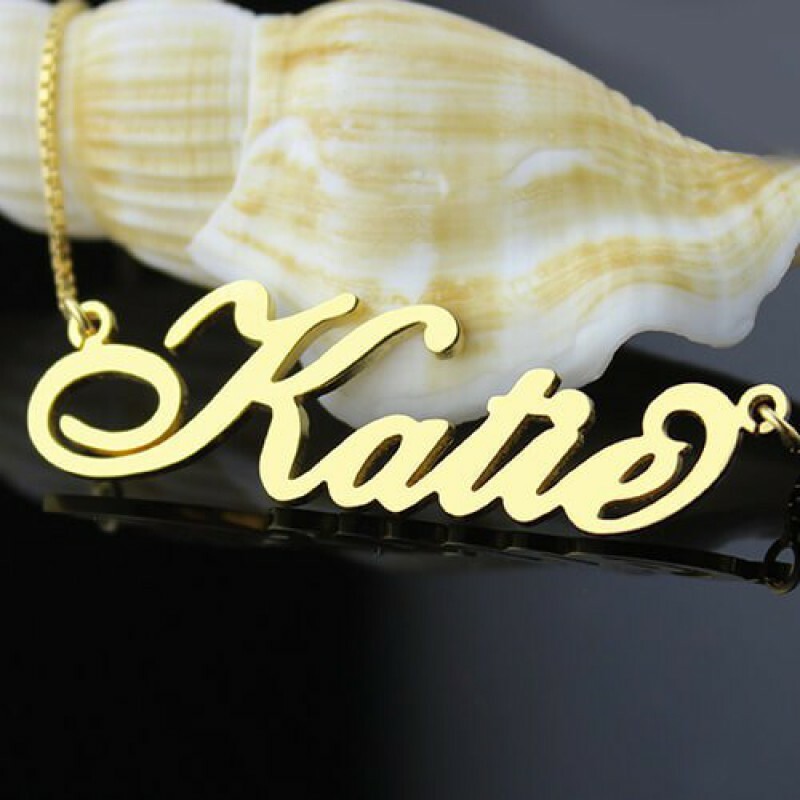 You could also have a decorative name necklace made for yourself with different designs and patterns like floral or leaves to give your personalized jewelleryand sweet touch. Cute, designer pendants that come in different shapes like a circular monogram pendant to make your jewellery look edgy and in vogue. Cool triangle shaped necklaces are also a trendy option to add to your jewellery collection as it comes in a variety of options like silver, gold or rose gold. 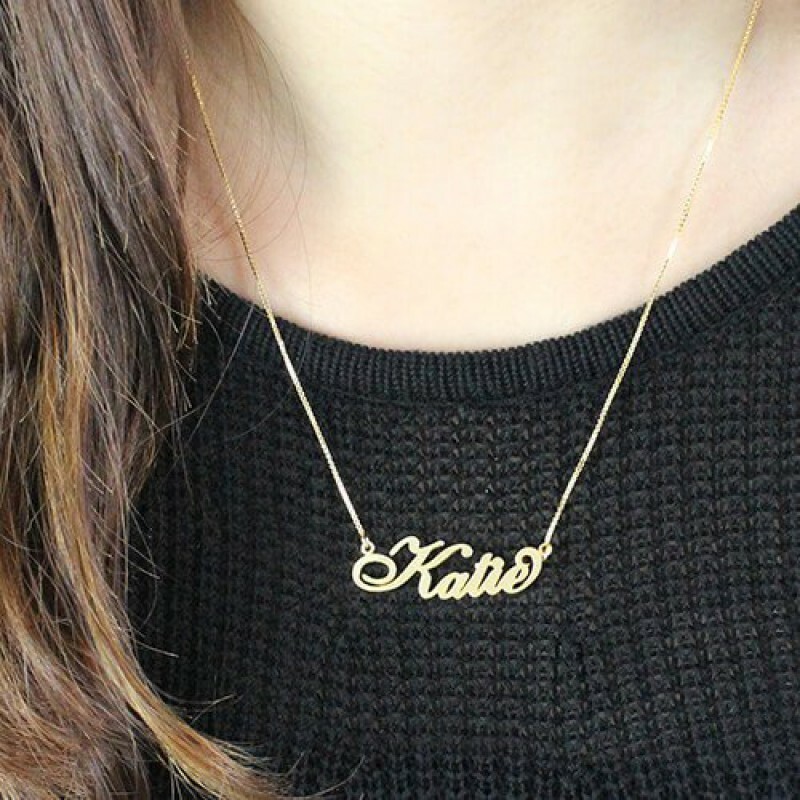 The fans of vintage fashion can also gift themselves with retro name necklaces that are inspired from the past and prove that vintage looks are still in trend. One light was brighter than the other. I decided not to put these on my shoes, instead I made it into a necklace. I'll use it when I go out for a run at night, or when there is a rave or party. Last fall, my sister-in-law was talking about a recent trip she and her husband had taken to Italian. And while there,they saw some Murano glass and really liked it and were so happy that they had previously bought prior to the burning of a theater in Venice. So, when I saw this glass pendamt, I knew it would be the perfect birthday gift -- which I had completely forgotten about until we spoke over the weekend and she thanked me very much for the lovely necklace.I can suggest that it would be a great gift for many ladies. Very classy and nice. Beautifully made. Got so many compliment from people. Everybody ask me where I got the necklace. The Diamod cut Rope on this Necklace is so pretty. 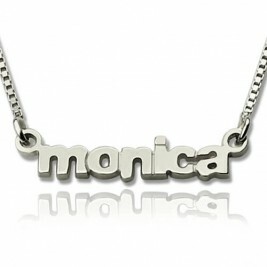 I just received it and it is soon to know about durability, however, an Italian Sterling Silver Necklace works for me!Love it. I'm extremely pleased with this item - it holds a lot of necklaces and allows me to hang them out in the open without looking busy. So necklaces are safe from getting kinked and also adds a nice accent to my room. I am pretty skeptical about the original price- the harp seems so simple and without much to it - no sure how it could cost as much as it is listed. Glad to pay the lower price that I did, which to me seems more appropriate for this item. I would probably buy more as gifts.